In this article we will see how to create custom component in adobe cq5 with custom dialog using CRXDE Lite, What are the Best Practices and approaches that should be followed and detailed description of each field used for creating component. Components are re-usable, modular units used to achieve specific functionality that can be present on webpage. The main advantage of having a component is it is modular and isolated individual units that can be reused across the application. Below are the general properties of a component. 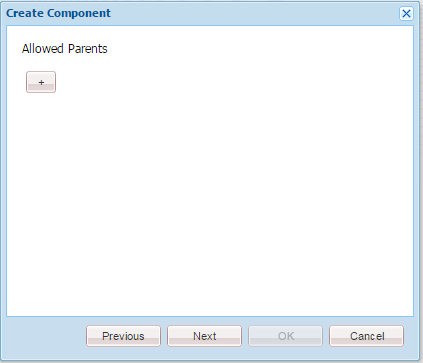 allowedParents: It specifies path of a component that is allowed to be a parent of this component. 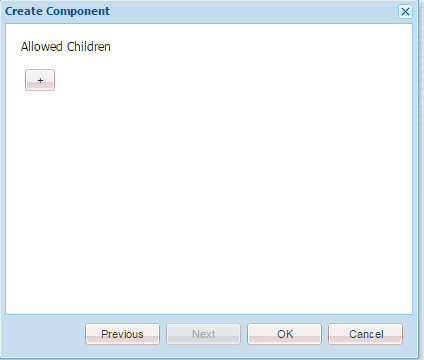 allowedChildren: It specifies path of a component that is allowed to be a child of this component. 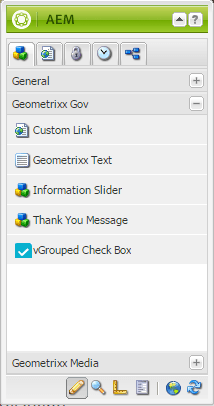 componentGroup: It specifies group under which the component can be selected in the Sidekick. sling:resourceSuperType: It is used to achieve inheritance in cq. When set, it inherits the specified component to this component. By copying component from libs folder and then renaming it. By creating a new component and then point it to libs-> foundation component. Change the jcr:title of new component (Like Custom Text Component in above example), so that we can easily distinguish it. 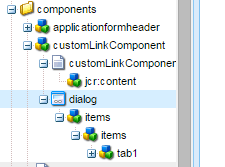 In CQ WCM , open a page in your web site in authoring mode you can see new component is available in the side kick under the component group that you have specified. 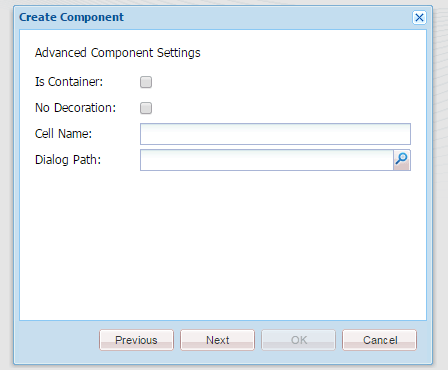 Here we will create a custom component with custom dialog, which will have three fields in its dialog. 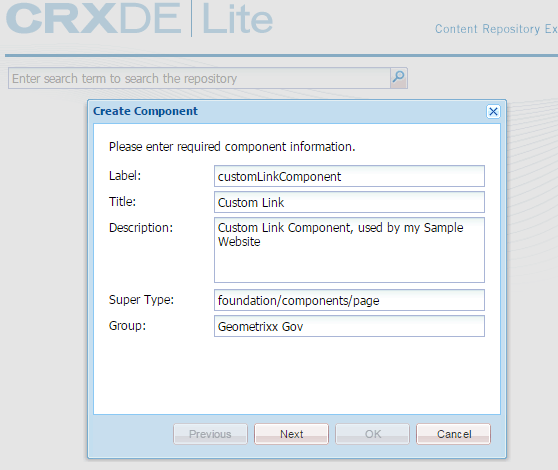 Open CRXDE Lite , create a component folder in apps/<myProject>. 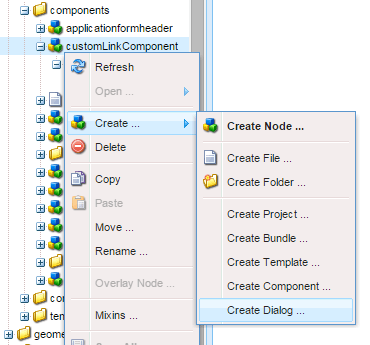 Right click on components folder Select Create –> Create Components. properties which we have already seen above. Click on Save All on top left of crxde to save the changes. Is Container: Enable to make you component as a container like parsys. Where content author can drag and drop other components. Cell Name: A unique div id that will be assigned to your component div. Dialog Path: Path of existing dialog that you want to reuse. 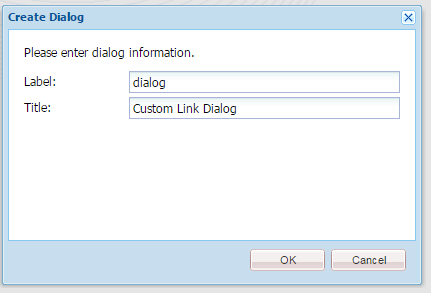 Right Click on customLinkComponent that we have created Select Create –> Create Dialog. Click OK and save all changes. You can see that your dialog structure has created. Provide a suitable name to tab1 value(For Ex: I have provided Custom Link Tab) and save changes. 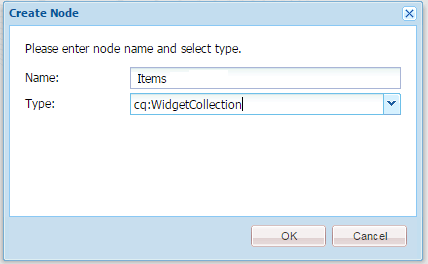 Right Click on tab1 or Custom Link Tab and create a node by Selecting Create –> Create Node of type cq:WidgetCollection. Note:- name of cq:WidgetCollection should be Items. 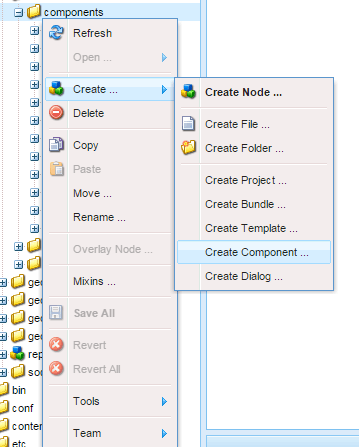 Create new node inside the componentItems node which we have just created and enter below details. Save the changes. your dialog structure would look like below figure. Add following properties manually (fieldDescription, fieldLabel, name, xtype) for the customDisplayText node to configure it as a text field. see below figure for reference. 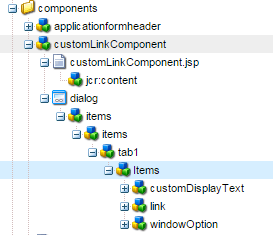 Open customLinkComponents.jsp and replace the existing code with below code. 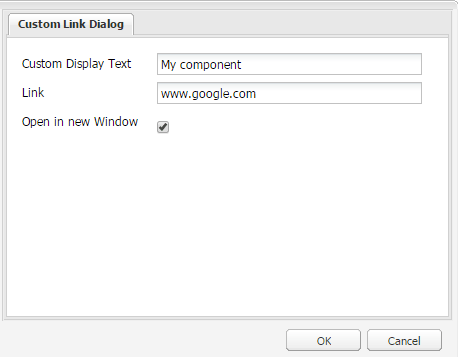 Drag the custom link component to page and double click on the link to view the dialog. 241 Responses to "AEM: Create Custom Component in CQ5 with Custom Dialog"
I do have 12+ years of Java exp and looking for AEM training, would you please help me on that? Sure please provide your email id, i have few good docs to learn AEM. Hi Ankur, can u pls send me the docs which u have to learn AEM. Hi Ankur…..Can u please forward me the docs to learn AEM from. I have been learning AEM for some time and have been following you. Your tutorial is quite good. Could you please help to send some docs which helps me to understand AEM. if you don’t mind Can you please send it to me it helps me. Can you please send the docs which you have for learning AEM. Hii,can you send me the docs of AEM to my mail [email protected]. I am new to AEM, can you please share usefull docs. I am starting to learn AEM 6. Your website name says CQ5 so does it cover AEM 6 or only CQ5? I am beginner in AEM. I have created one ot two static pages following your tutorial and using CRXDE lite. But Now I want to create one small website with four to five pages and with navigation between them, such as giving user id password login to another page like that. Can I make this using CRXDE lite or I need to use eclipse. Is there any sample doc for this? I have AEM 6.2 standalone. Could you please provide me the docs to learn AEM. I have 4 years experience in Java and couple of years in UI. Would be great help. Can you please send the docs to me..
Can you please forward those docs to my mail if you don’t mind. Please send me the documents if possible , i will be grateful. I am solution architect ( Oracle ATG Architect ) can you fwd me good tutorials on AEM6 or CQ. I have sent you the Training and study materials. Please let me know if you haven’t received it. Could you please send the docs that shared to others for learning to my email id as well? Currently on TeamSite, wanted to learn AEM. I am basically a java background.I understood basic Stuff in AEM.Could you please share me the Document Details about TouchUI and classicUI. Can you send the docs please. Nice to see you are helping a lot. Can you please send Training and study materials to me also ? Hi, I follow this tutorial today and i have a little problem. I can see and use my custom component but i db-click on it, i just see the panel (nothing inside). I checked all the properties and i didn’t see anything. Sure i would love to help u out. Could you please mail the package at [email protected]. A guy from Adobe came to my company, so he explained how make own components. Thx for your help ^^. I am in the processing of learning AEM and had experience in Java ..Could you please share the documents ? Can you please send the material to [email protected] as well. can u please send AEM documents? I am learning AEM and had experience in Java ..Could you please share the tutorial and documents? Could you please send me the AEM material. I am very fond of learning this technology. The article above was really very helpful. As I am a fresher in AEM, so it helped me a lot in understanding the basics. I have support exp in adobe CQ5 but now i am looking for development also can you please send doc and help me but i don’t have that much of java knowledge. Your site is excellent and helpmed me a lt. thanks you very much ankur. my email id: [email protected]. how to set a design for a custom made template ? My mail ID is [email protected]. I am new to cq/aem. I am learning alot from your website. If u provide docs and material to me, it will help me alot. Could you please share the documents.. I have around 8 years experience in Java & .net. Can you share some documents with me as well. If sidekick is coming blank, then you have to edit a parsys on the page then select your component group and make it visible. Note:- you should have atleast 1 parsys on the page. Please forward me the docs. I want to learn AEM more effectively..I do have 2 years of experience in AEM. I am working in support project but now i am learning development as well . This site helped me a lot.step by step you explained very clearly with screen shot thanks lot! I want to learn AEM for one of my projects. Could you please forward the study material to my email id too. Nice Explanation! I have been learning AEM for my project. I am very new to AEM development. Can you share study material over my email? I am new to CQ5/AEM. I am learning a lot from your website. Could you pls send me the docs and material to my mail id, it will very helpful for me. can you explain about difference between adobe cq versions..or send doc to mail id plz.. Thanks for sharing the knowledge… I started learning AEM(beginner) and planning to take both development and Arch certificate going forward. Could you please share the documents to learn from beginner to advanced along with the documents you forwarded to the other users. Awesome write up. I would really appreciate if you can send me any notes you have to [email protected]. I am new to AEM. I’ve started learning from your website. customDisplayText cq:widget property image is not getting displayed can you please fix it. I do face the same issue that has been reported here, i don’t the text fields in the dialog. Can you also let me know how to create the same component for touch UI. Thank you for the nice tutorial on Adobe AEM. If you can provide me docs, it will be really helpful. I installed AEM 6 in my local and trying to work on it . I am very new to AEM technology.Please send me some docs so that i can learn this technology. My email-Id is [email protected]. I am new to AEM can you please send me the material docs to learn more about it. Can you please send me the Adobe CQ5 documents too. Could you please share Adobe CQ5 documents. can u suggest some good materials to study AEM. I am new to this AEM. I like to enhance my skills in AEM. So kindly forward the documents to my email ID,then it will be helpful. It will great help to me. So can you please send Training and study materials to me also ? I am new to AEM could you please share docs related to AEM so that I can improve my knowledge in AEM. I am a java developer looking to fill AEM role. I really like the information on your site. if you still are sharing the tutorial documents i would love to see them. I have support exp in adobe CQ5 but now i am looking for development also can you please send some good document. Your site is excellent . If possible please upload the documents in this site itself, which are forwarding one – one. So that we can easily access from here for any reference. Thank you for creating this AEM tutorial. Would it be possible for you to Email me a package ZIP file containing your Custom Link Component? In few organisations images are blocked, thats why it might not be opening. Try changing url from http to https://www.aemcq5tutorials.com/tutorials/aem-create-custom-component-in-cq5/?ss in last you can add any query parameter. Thanks a lot for creating this AEM tutorial. Can you please send me the docs which you have for learning AEM. Your jsp does not work. How I make set link in <a href="…" ??? I’m a java professional and currently working with CQ5 based projects. Eager to learn concepts of cq like components, templates more. Please forward the docs which could help me to increase my knowledge. I followed all the steps mentioned in the tutorial. I’m stuck at a point after dropping dialog on my page. When I open the dialog, nothing is visible. Ideally it should display three cq:Widget items that I’ve added on the page. A collection Widget must be named as ‘ items ‘ not ‘ Items ‘. That is the problem. Your articles and videos are very useful, thank you! Could you provide me these training docs as well? i m shakshi, i am new to AEM ,your this tutorial is very useful for me to learn.but images are not displaying .if possible ,please send me some benificial documents of yours. Excellent tutorials here! I’d much appreciate if you could forward your AEM docs to [email protected]. Could you please send me too.. My email is: [email protected]. Really appreciate the content and ease with which you have written the blogs. Would help anyone who is a beginner or advanced developer in AEM. KUDOS TO YOU!!! keep the hard work ticking. I am learning AEM, found your blog its very helpful to me. Could you please forward notes and docs to learn more about AEM. Hi All please don’t post your email id’s over here and i have already converted those docs learning in these post. So that it will be easy to maintain and learn. I am also learning AEM.Can you please share the study material with me as well. Could you please send me as well. Please send me the Dox as well. Can u please send me all the docs which you have to learn AEM from basics. I am learning a lot from your website, can you please provide me with AEM documents. Can you please send me any material to create custom components please. I am a UI dev starting to learn AEM authoring. I am completely new to AEM. Could you please forward docs to [email protected]. That would be so helpful.Thanks in advance. as beginner while setting properties (fieldDescription, fieldLabel, name, xtype) for customDisplayText component not able to getting vale of respective key . pls can anyone help me into this ? Can you please share the study material with me as well. I am java and android. Can you please send me the study material please. I m new to AEM, and following your tutorials. Its really very helpful. i am new in AEM, please send me the useful documents. Can you please share with me as well. The image below this is not loading. Also can you mail me AEM study material on [email protected] if that is possible. Thank you for the help and your blog is amazing. The jsp code which you have given was throwing an error. Please replace the first line with and update the code so that others will not face the issue. i am new in AEM, can you send me some docs to learn it? my email id is: [email protected]. Kindly send me some docs to learn it. It will be of great help if you could send me the documents. It would be helpful if you share the doc file. Could you please send it to [email protected] ? Could you help me with some docs and your experience at AEM. Send me your available docs, please. I am facing some issue in building bundle through maven.In core section sampleHelloWorld1 class is not loading while i am running clean autoinstall. Can you suggest me solution.